Award -winning collagen induction treatment. This micro-needling treatment improves wrinkles, scars, acne scars, stretch marks and hyperpigmentation. Little to no down time. Reduce pore size while improving skin tone and texture. Restore your hands to a more youthful appearance by removing age spots and treating broken capillaries. A non chemical peel. This treatment avoids damaging the epidermis by by penetrating 23 high-dose active ingredients into the dermis. Treatment is customized to specifically treat acne, aging skin, rosacea, and pigmentation. A procedure where tiny particles “sand” or “polish” the skin and gradually remove scarred or discolored epidermal tissue. This makes microderm a great treatment for acne, scarring, hyperpigmentation, and wrinkled skin. Microderm can also be used for treatment of acne, but must be repeated periodically to be effective. 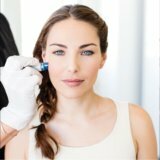 (microdermabrasion should not be used on patients who have taken the medication Accutane (Isotretinion) in the previous twelve months). Painless medical grade chemical peel suitable for all skin types. Addresses anti-aging, pigmentation, acne and acne scars. Includes a take home kit of post-peel products to ensure optimal, long lasting results. 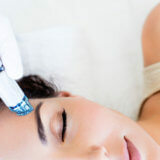 Diamond tip microdermabrasion combined with serums that help to detox, hydrate and plump the skin. Antioxidants helps to create healthy skin tissue for a glowing appearance. Brighten your skin, exfoliate dead skin cells, remove vellus hair and gently cleanse away impurities. A patented CO2 direct delivery system that expedites active ingredients into the skin faster than other applications. After one treatment you will see immediate results in skin tone, smoothing of fine lines and extremely soft silky skin. A medium to deep peel that dramatically improves fine lines, hyperpigmentation, acne, skin texture and sun damage. Includes post care kit and follow up hydration treatment. The light chemical peel improves acne, oilyness associated with acne, acne scars, skin texture, and reduces the effects of sun damage. light peels also serve well for maintenance in between medium to deep peels. the medium chemical peel improves acne, smoothes fine surface wrinkles, and corrects pigment problems suchas age spots. the deep chemical peel helps treat sun-damaged skin, eliminates deep, coarse wrinkles, and can remove pre-cancerous growths. Is a light to medium peel, the depth of which is controlled by the amount of time you leave it on your skin. These peels can have heavy peeling, crusting and take between 1 to 2 weeks to completely finish the peeling process. These are our most popular peels because they make the most difference, helping to smooth lines, plump up skin, strip off sun damage and reveal smooth even skin. This is a very safe peel and is suitable for most skin types, however, some darker skin tones, particularly African American run a small risk of post peel hypo pigmentation. Because our treatments are result driven all Laser Lounge facials include one or two light peels depending upon your skin type. Slight tingling may occur with a light peel and we do everything we can to keep you comfortable and relaxed during your treatment. – accutane use within the past six (6) months, (Accutane should not be taken for at least six months after the peel either. There are reports of scarring in people who have taken Accutane after a peel). – severe Psoriasis, Eczema, Dermatitis, Rosacea (mild is ok).